Amy Lerner has always been a tinkerer. She began her career designing functional clothing for people with disabilities, and parts of space suits for ILC Dover (supplying NASA) before turning to biomedical engineering. She completed her first bachelor’s degree at Cornell University, in textile science and apparel design, which she enjoyed for its focus on functionality. Her latent interest in biomedical engineering surfaced as she studied the biomechanics of the hand in order to design a functional glove for space suits. After more than four years working in industry, she decided to go back to school, earning a BS in mechanical engineering from the University of Delaware and then a PhD from the University of Michigan. 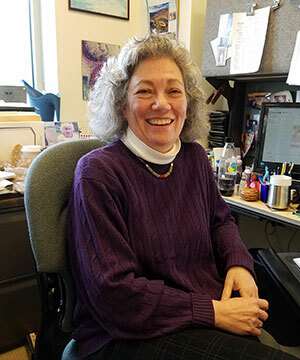 Today, she wears several hats at the University of Rochester: associate professor of biomedical engineering, chair of BME Undergraduate Curriculum Committee, and academic director of the Center for Medical Technology and Innovation. Lerner started the year-long senior design program in BME, which has grown over the years. Now, on Design Day, students from all across the Hajim School show the Rochester community the projects they have been working on with local companies and institutions. Lerner observes that it is important for students to check in throughout the year, following guidelines and getting feedback at every step of the design process. And while Design Day is an exciting milestone, it’s just one of many, she notes. Lerner is the chair of the new Commission on Women and Gender Equity in Academia. She points out that the BME department has the highest number of women faculty members in the Hajim School. Similarly, the apparel design courses she took at Cornell consisted of mostly women, which she credits with helping her to develop a sense of self and confidence. She remembers, however, that when she was doing her mechanical engineering doctoral degree, she often was the only woman in the room. Lerner believes that much of the difficulty for women in academia is at the policy level. Such issues affect not just women, but families as well, and therefore need to be addressed in the pursuit of equity. That’s why she thinks it is important to consider relationships between spouses, children, and parents when developing cultural and policy change. She feels that institutions as a whole need to give their employees more flexibility to take care of their own lives, too. Lerner has always been the outdoorsy-type. She enjoys kayaking and gardening and has recently realized that she can hike in the winter, too.